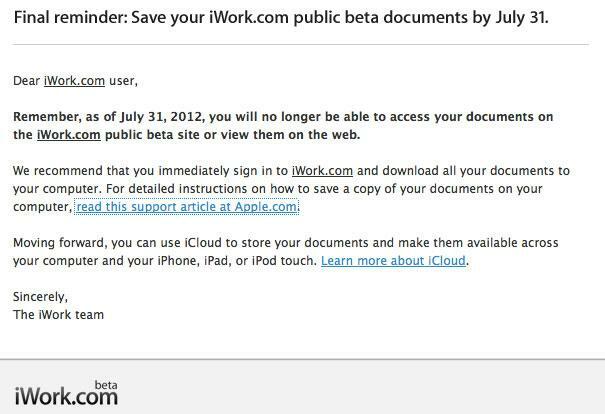 Apple on Tuesday issued what it called a "final reminder" to users that they must save their iWork.com documents before July 31 or lose them forever. The iWork.com beta website will close in one weeks, after which users will no longer be able to access their documents on the iWork.com site or view them on the web. Apple has recommended once again that users immediately sign in to iWork.com to download documents and ensure they are not lost. An accompanying support article also details how users can save a copy of their documents onto their computer. "Moving forward, you can use iCloud to store your documents and make them available across your computer and your iPhone, iPad or iPod touch," the e-mail sent out on Tuesday by Apple reads. Apple has sent out numerous reminders, including one earlier this month, encouraging users to back up their documents. Apple first notified customers in March of its intent to shutter the iWork.com website by the end of July. The iWork.com service first launched as a beta in early 2009, offering iWork users on the Mac the ability to more easily collaborate with others using Windows and Microsoft Office. Now, the iWork suite of applications is become available on iOS, with Pages, Numbers and Keynote among the most popular downloads on the iPad App Store.